Anyone who has followed this Russia investigation in detail immediately had one name spring to mind after reading this charge by Mueller: Konstantin Kilimnik. Manafort spokesman Jason Maloni has called Kilimnik a “longtime business associate.” Politico summarized Kilimnik’s backstory in a report about Manafort associates being concerned about his “Man in Kiev” during the 2016 campaign. Politico spoke to Kilimnik’s contemporaries and found that it was an open secret that Manafort’s man handling his affairs in Ukraine was trained by the Kremlin. It soon became an article of faith in IRI circles that Kilimnik had been in the intelligence service, according to five people who worked in and around the group in Moscow, who said Kilimnik never sought to correct that impression. The Atlantic obtained e-mails exchanged during the campaign between Manafort and Kilimnik. They spoke about “OVD,” which is short for Oleg Deripaska, a Russian oligarch whom Manafort had worked closely with for years on a $10 million annual contract (Deripaska also requested immunity from Congressional investigators to testify about Russian meddling in the 2016 election). 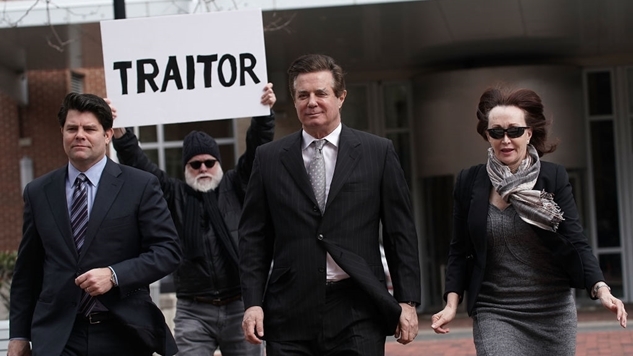 So fast-forward to April 11, 2016—two weeks after Manafort was named Trump’s campaign manager—and leaked e-mails published by The Atlantic indicate that Manafort was still very much working for his former boss. The “get whole” reference seems to be asking about resolving debts, which may be linked to Deripaska’s 2009 lawsuit against Manafort, alleging that the future Trump campaign manager stole $19 million from him. The Washington Post also reported that Kilimnik and Manafort discussed the DNC hack in August 2016. There’s enough smoke here for a ten-alarm fire. Not to mention, Manafort isn’t the only high-level member of the Trump camp connected to Russian military intelligence this week. Roger Stone admitted that he spoke to Guccifer 2.0 during the 2016 campaign, and the Twitter account was just revealed to be a front for the Kremlin. Again, there’s no confirmation in this document that Person A is Konstantin Kilimnik, but we knew before this court filing that one of Manafort’s most trusted men was openly known as a GRU spook. If Person A isn’t Kilimnik, then Manafort may be in bigger trouble than it already seems. At minimum, Manafort leaned on a Russian military intelligence veteran to manage his deals which were financed by a Putin ally in a country invaded by Russia, and continued that relationship while he sat atop the Trump campaign. This is the context to which he entered Trump’s universe.